These miniature cabbages are a delicious side dish and so versatile. 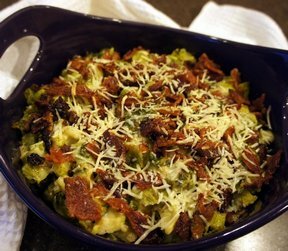 The bacon and cheese make the perfect combination to a rich an tasty vegetable that everyone will love. 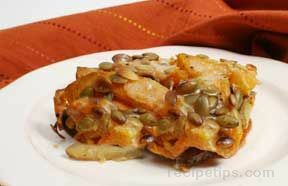 Preheat oven to 400 degrees F. Grease a 3-quart baking dish with nonstick cooking spray. Place Brussels sprouts on a baking sheet. Drizzle with olive oil. Add garlic and shallots and season with salt and pepper, tossing to mix. Add milk and heat until mixture is thick and bubbling, about 4 minutes, stirring constantly. Remove from heat and stir in cheese. Add 2 tablespoons of Parmesan and stir to combine. Mix in salt and pepper to taste. Stir in Brussels sprouts mixture. Pour the mixture into the prepared baking dish. Sprinkle with remaining Parmesan cheese and bacon. 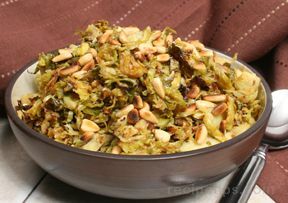 "I love roasted Brussels sprouts but this added even more! 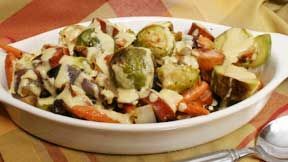 The Brussels sprouts were roasted to get carmelized and then added to a cheesy white sauce and topped with bacon! Wow!"